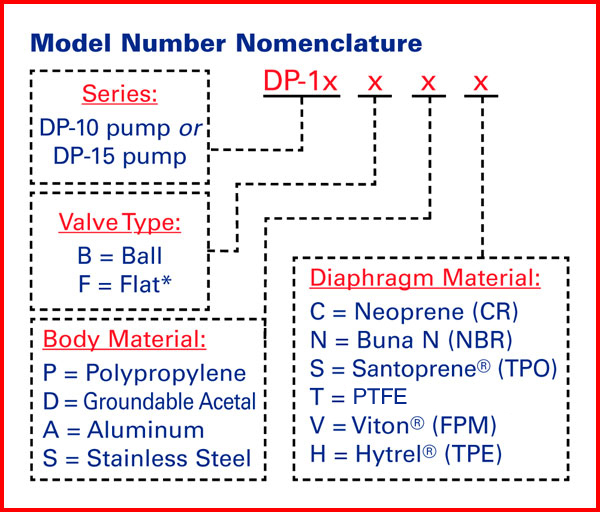 1 Polypropylene and acetal pumps have a maximum liquid temperature of 180°F (82°C) regardless of diaphragm material. Hytrel®-fitted pumps include Hytrel® check balls and Buna N wetted o‑rings. Santoprene®-fitted pumps include Santoprene® check balls and EPDM wetted o‑rings. Yamada® is a registered trademark of Yamada America, Inc. Hytrel® is a registered trademark of E.I. du Pont de Nemours and Company. Santoprene® is a registered trademark of Advanced Elastomer Systems. Viton® is a registered trademark of DuPont Performance Elastomers. Due to Yamada's continued commitment to product improvement, specifications may change without notice.